There has been an amazing level of demand for clocks this year, including lots of clock orders for Christmas. The ones that I have received to date (29/11/2011) WILL get there on time. Any orders that I receive from now onwards may not be able to be delivered in time for Christmas. I will try to get them out, but with the general postal slowdown, they may not make it in time. I thought I would add a post here to let everybody know that I am on Facebook! I love the interactive nature of the Facebook environment, and the fact that I can so easily load photos of new clocks as I make them – Much easier than this website. I like the way that only the last 2mm of the button shaft pokes through the bottom of the clock. It is pretty unobtrusive (but then again it is invisible behind the faceplate). Adam has been working with me on a new stencil for his clock – he would like it to be pretty large. He liked the original clock, with its filled in face, so here is his spin of the faceplate – It uses red vinyl on clear acrylic. This is a test stencil that I cut last night (mounted on a 300×300 sheet) – His has much larger borders, but he is sticking with the 250x250mm letter field. I believe that it isn’t half bad – It needs a new lightbox enclosure to be designed, but it should look awesome lit up! There is something weird hapening with the color balance on my little camera – It is actually RED. 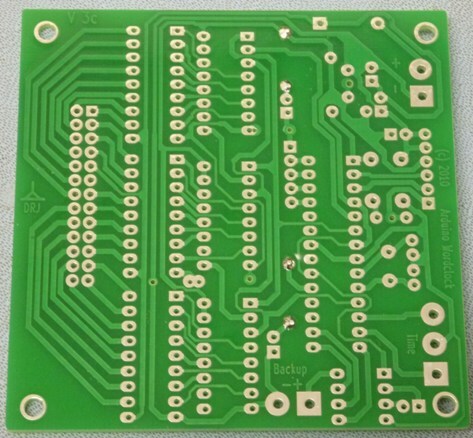 Here is a photo of the new PCB. It turned out pretty well! WOW – I would have never thought that this would have turned into the amazing activity it has. Since I started making clocks, and clock kits, I have now sent out over 100 clocks (131 – today ) to all continents around the planet. Thanks everybody for the amazing experience of being able to make this project ! OK – One helpful person has said that it has been a long time since I have updated this blog. I have to admit that I am bad at blogging – I am much more a doing person. I have been active at Instructables.com building projects that are designed to do network functions, but at the same time, I have been progressing the design of my clocks. 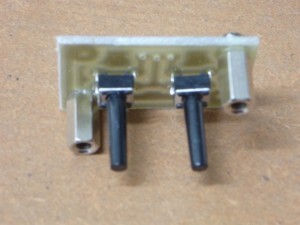 To make assembly easier, I have had a batch of Arduino wordclock controllers made by a PCB manufacturer. That means that I don’t have to slave over a pot of Hydrochloric acid etching boards! For my first ever commercial board, I am really pleased. I will upload a photo when I take one! I have included a gallery of peoples clocks that they have made. If you would like to see your clock up here, just send me in a reasonable quality photo. I love to see the creativity that people have in producing amazing artworks. After a bit of coding, I now have the ability to add minute LEDs to the clock – they an optional add on, and can be installed by the user, or installed by me when the clock is built. Any clock shipped after May 1, 2010 has the new firmware. 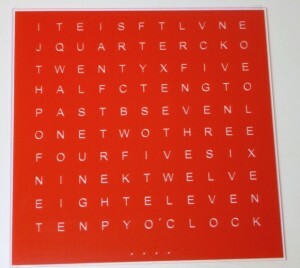 Here is a simple blog to share ideas relating to my Word Clock projects. I intend to add photos of recent clocks, and actively promote a forum where people may share ideas.